CODAC is responding to the growing epidemic of opiate addiction by expanding the ability to provide comprehensive medication-assisted care for people in our community living with an opioid use disorder (OUD). In November, CODAC opened a new beautifully renovated Medication Assisted Treatment (MAT) clinic located at 380 E. Ft. Lowell Rd. 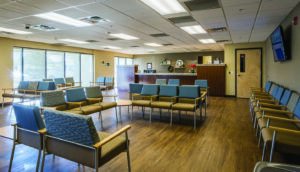 This outpatient treatment center offers more than 19,000 square feet of space for members to receive comprehensive care for opiate addictions. With more than 550 members receiving services monthly, this clinic provides ample space and the upgraded capacity to provide support and quality treatment to members in recovery. 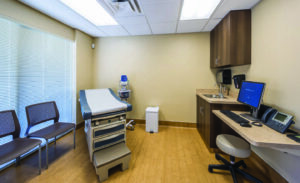 The building furnishes nine medication dosing windows (to efficiently accommodate the demands of dosing large quantities of people), two physical exam rooms for primary care, an on-site laboratory, a variety of spacious meeting and group rooms, and much more. “This state-of-the-art clinic provides a calm, healing and therapeutic environment for staff and members. We have more space and a peaceful environment to provide quality addiction care,” says Dr. Larry Oñate, Medical Director. With the safety of members, staff and the community in mind, the building contains extensive on-site security which includes 24/7 law enforcement and security presence, dozens of surveillance cameras, pharmacy grade construction and expansive intrusion and burglary monitoring. Construction was completed by Rio West, Inc., who also owns the building. The architect was Intertech Architectural Interiors, Inc. Furniture brokered by J. Kaiser Workspaces. Security by Protection One. For more information about CODAC’s MAT services, call (520) 327-4505.